There was a mood of festivity at home. Everyone looked cheerful and the house was packed with guests. There were giggles and gossips in every corner of the house. Chennai’s torrential rain wasn’t really hampering our together times. Sun hardly smiled at us today, rain kept singing aloud the entire day, heavy traffic on the roads, knee-length water everywhere, power-cut for more than 12hrs — it wasn’t a pleasant day for others but we guys had a lovely time together. Hot, spicy and steamy stomach filling meal is just apt for this weather. My grandmum had decided our menu for the brunch that day. She just needed suggestion on the side dish. We wanted something spicy, crunchy and also fun to cook together.We always crave for the dishes made from our country vegetables. She had brought tapioca from our village, so the unanimous decision was to have tapioca cooked in a spicy coconut masala. 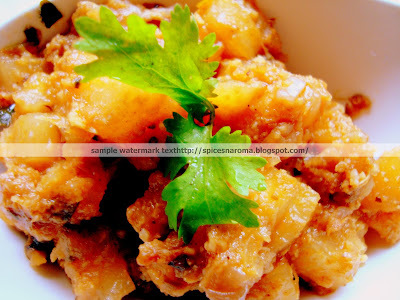 This is one of my grandmum’s signature recipe and it tastes great with rasam. Grind the coconut and fennel seeds with little water to a fine paste and keep aside.Dry roast the garam masala ingredients. Cool and grind to a fine powder. Set aside. Heat the oil in kadai. Add the powdered masala, ginger-garlic paste and curry leaves and stir for few seconds. Saute the onions till brown in the tempered oil. Add the cubed tapioca with little salt and let them cook for a couple of min. Add the turmeric powder, coriander powder and chilli powder. Cook till the raw smell disappears. It would take about 3-5min. This looks awesome. Beautiful color. Have never tasted tapioca before but I love the garam massala ingredients so I am sure I would like this. lovely pictures! this looks really interesting! i’ve finally started posting again. 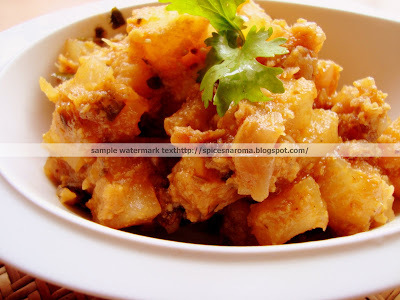 I never tried any dishes from this maravalli kilangu… yrs looks colorful and must be tasty. This is the same as cassava right? I have not tried tapioca ever. sounds yummy. will check out in my next shopping to get some. a very different recipe! sounds interesting… will try soon..
looks so inviting!! I love tapioca chips and this way too. check out my blog for something new and spl waiting for u to pick up in my IT’S TIME TO .. “THINK AND THANK” (100th POST). I’ve not had tapioca cooked this way… but i love the taste of tapioca chips so must look for these.